Gumleaf skeletoniser, Uraba lugens (Lepidoptera: Nolidae), is a native Australian defoliator of many Eucalyptus and related species, and has recently established in New Zealand. Outbreaks of this species have caused significant damage to natural and commercially managed forests in Australia, and threaten plantations and amenity trees in New Zealand. 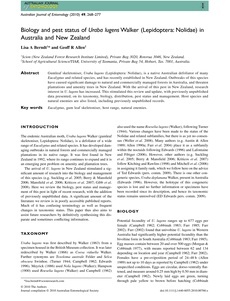 With the arrival of this pest in New Zealand, research interest in U. lugens has increased. This stimulated this review and update, with previously unpublished data presented, on its taxonomy, biology, distribution, pest status and management. Host species and natural enemies are also listed, including previously unpublished records.